Be Green on St. Patrick's Day! Is donning a shamrock on St. Patrick's Day just not making you feel GREEN enough? 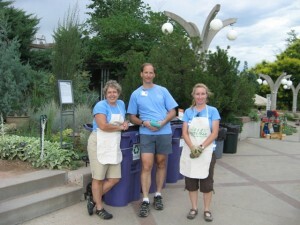 Becoming a volunteer with Denver Botanic Garden's Green Team will do the trick! The Green Team is a volunteer organization dedicated to living sustainably and educating the public on environmentally conscious practices. The Green Team is currently looking for eco-friendly volunteers to help out during Free Days and Special Events, assisting the public in diverting waste to compost or recycling. Aside from the benefits of helping the environment, the Green Team participates in trainings and field trips to help you learn how your waste impacts future generations of plant lovers, and what you can do at home to help reduce your carbon foot print. The first Green Team training for 2011 is going to take place Thursday, March 17 from 5:30-6:30 p.m. in Gates Lecture Hall. A RSVP is required to participate in this GREEN event, so please e-mail vol@botanicgardens.org if you would like to attend. Thank you for considering this opportunity, and with the luck of the Irish, we’ll see you on St. Patrick’s Day!